Does the venue fit the company's corporate image? Will the venue's staff add to the attendees' experience in a positive way? Does the location offer the necessary road/rail/air links? Is the venue location suitable for any extra events/shows/excurisions that have been planned? Are any extras such as equipment, accommodation, etc. available on the dates required? Is the seating capacity suitable? Are the meeting rooms large enough to provide a comfortable experience for those attending? Are the meeting rooms well laid out? Do they allow for good views of the speaker without any obstructions? Does the venue allow attendees to move around without bottlenecks and delays? Does the venue have a variety of rooms if required? An auditorium if necessary? Small rooms for break away meetings? 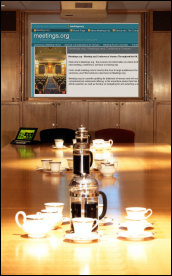 Can the venue offer a projector, electronic whiteboard, stationery, etc. Does the venue offer wifi internet access? Do they have a photocopying/fax service? Can they make available laptops or PC if required? Can they provide refreshments, tea/coffee/meals? Does the venue have enough parking spaces? Are the rooms well ventilated and temperature controlled? Is there a restaurant or bar for post-meeting networking and entertainment? Do they have sports and leisure facilities such as a pool or gym? Can the venue also provide accommodation if required? Does the venue fall within the budget for this meeting? Can they offer any discounts? Is a deposit required and if so how much and how far in advance? What is their cancellation policy? Will you receive a full or partial refund? A lot of the above questions can be answered by a visit to the venue's website and by asking for a quote. If it is a venue you have never used before you may want to ask the opinion of other companies that have held meetings and conferences there to find out what their experience was like. If the meeting or conference is an important one you may wish to visit the venue personally to get a first hand impression of the layout, suitability and, very importantly, the attitude of the management and staff. At the end of the day you want to get the most out of your meeting and the venue you choose has to add rather than detract from the experience of those attending. So take the time to choose carefully.